I'm Interested in a Demo! 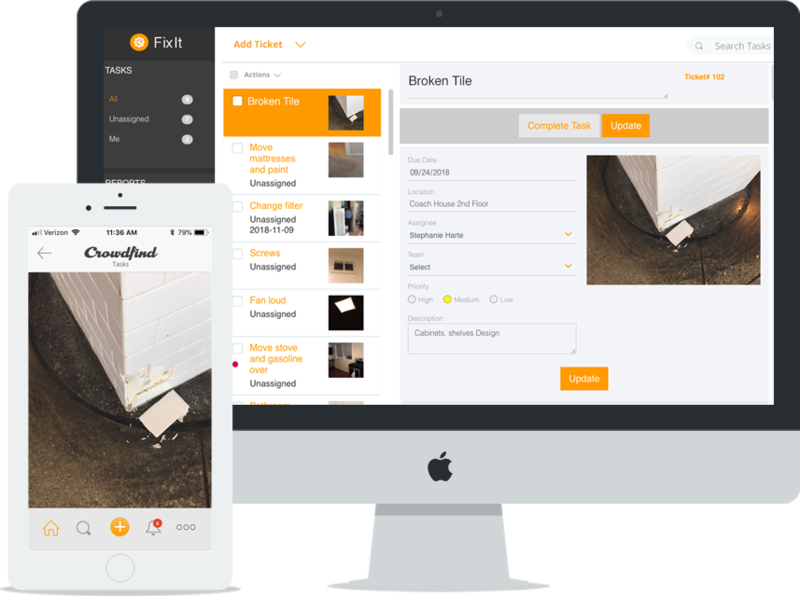 Ready to see Crowdfind’s Maintenance Software in action? Experience how easy-to-use it is, learn about the features, and see why its price of just $19/month is such a great deal. Fill out the form below to schedule your maintenance software demo! We made our Maintenance Software as easy-to-use as possible. We like to say it’s as easy as taking a picture. Simply take a photo of the issue, instantly create a work ticket, and notify the maintenance team. Once it’s fixed, the maintenance team snaps a photo of the completed project, notifying everyone that the task is complete. From the dashboard, you can also manage all the work orders. You can add due dates, assign to teams, define priorities, comment on the task, and get notifications and updates. You can see all open tasks in one place and sort your task view by the priorities and due dates. With our Maintenance Software, you provide your staff with an easy and defined process. When they see something is broken or needs attention, they instantly know what to do. It is quick, easy, and can help keep your business in top shape for your customers.